Bruno Scantlen was born circa 1874 at Ohio. He was the son of Felix Scantlen and Catharine (?). [S246] U.S. Federal Census 1880 U.S. Federal Census, by Ancestry.com, Year: 1880; Census Place: Delaware, Defiance, Ohio; Roll: 1011; Family History Film: 1255011; Page: 153C; Enumeration District: 236; Image: 0532. John Scantlen was born circa 1876 at Ohio. Married Name Her married name was Wolff. Dianne Jean Pickard was born on 2 July 1949 at Wisconsin. She was the daughter of Wallace Pickard and Eleanor (?). Dianne Jean Pickard died on 30 August 2010 at age 61 Dianne Jean Wolff age 61 died on Monday Aug 30, 2010 at St Clare Hospital in Baraboo, WI., following a long illness. Dianne was born in Ladysmith, WI on July 2, 1949 to Wallace Pickard and Eleanor (Bemis) Roberts. She was employed Chula Vista in the Dells and was a former employee at Rex's Innkeeper in Waunakee. Dianne enjoyed gardening and raising flowers, but especially enjoyed being with family. Survivors include her children Tina (Duane) Novy of Montello, Gabriel Wolff of Portage, Courtney Wolff of Santa Cruz, CA. and Jacob (Jennifer)Wolff of Sun Prairie. Two brothers Dale (Dolores) Pickard of Phoenix, AZ and Doug (Sara) Pickard of Madison and one sister Darlene (Larry) Nowotny of Crest Hill, IL. Six grandchildren; Allycia, Brianne, and Owen Novy, Kayla Wolff, and Finnley and Harper Wolff. Three aunts Dorothy (John) Schroeder, Marilyn Dempsey, and Jeanne (Pete) Wolf. Dianne was preceded in death by her parents, a niece Sarah Nowotny and her aunts uncles and cousins. A memorial services will be held on Friday Sept 3, 2010 at 11:00 a.m. at the Winn-Cress Funeral Home 5785 Hwy Q, Waunakee, WI. A gathering reception will follow at Rex's Innkeeper in Waunakee. Jacob Gene Wolff was born on 10 April 1983. He was the son of Dianne Jean Pickard. 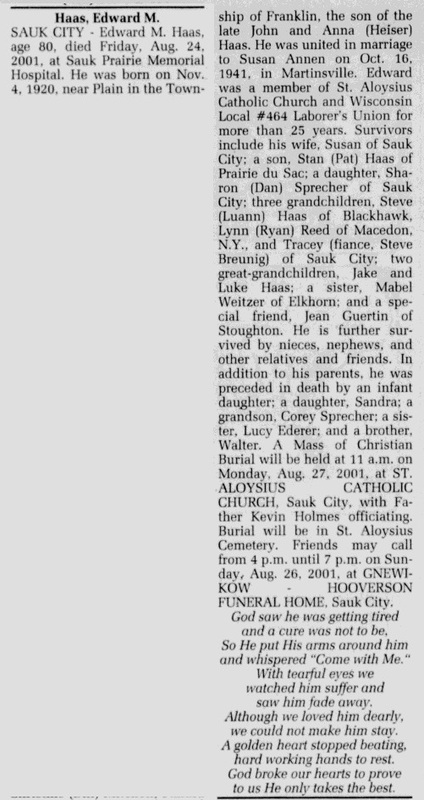 Jacob Gene Wolff died on 2 June 2011 at age 28 Jacob Gene Wolff, age 28, died unexpectedly on Thursday, June 2, 2011. He was born on April 10, 1983, the son of Robert Wolff and the late Dianne (Pickard) Wolff. He was a resident of the Sun Prairie area all his life. He married Jennifer Pearson on Nov. 3, 2008, in Madison. Together they have two daughters and a son on the way, Finnley Gracon, Harper Campbell and Avery Gene. Jacob was an adoring father and husband, a loyal friend and devoted son. He enjoyed movies and music. He was politically aware of the world and loved early morning talk radio on The Mic. Jake will be dearly missed by his family and friends. Jacob is survived by his loving wife of three years, Jennifer; daughters, Finnley Gracon and Harper Campbell; a brother; two sisters; a nephew; three nieces; his father; and many aunts, uncles and close friends, including his dog, Lily. He was preceded in death by his mother, Dianne and grandmother, Ellie. A Celebation of Jacob's Life will be held at 11 a.m. on Wednesday, June 8, 2011, at CRESS FUNERAL HOME, Sun Prairie. A visitation will be held one hour prior to service. In lieu of flowers, please make donations to the family to help with funeral expenses. Wallace Pickard married Eleanor (?). Married Name Her married name was Pickard. Married Name Her married name was Roberts. Eleanor (?) married Wallace Pickard. Eleanor (?) married Bemis Roberts. Bemis Roberts married Eleanor (?). Edward M. Haas was born on 4 November 1920 at Plain, Sauk, Wisconsin. He was the son of John A. Haas and Anna M. Heiser. Edward M. Haas married Susan Annen, daughter of Nicholas Annen and Cornelia Faust, on 16 October 1941. Edward M. Haas died on 24 August 2001 at age 80 Edward M Haas obituary. Married Name 16 October 1941 As of 16 October 1941,her married name was Haas. Susan Annen was born on 6 December 1920. She was the daughter of Nicholas Annen and Cornelia Faust. Susan Annen married Edward M. Haas, son of John A. Haas and Anna M. Heiser, on 16 October 1941. Susan Annen died on 8 June 2010 at age 89 Susan Haas, 89, of Sauk City, died Tuesday, June 8, 2010, at Maplewood of Sauk Prairie. Mrs. Haas was born on Dec. 6, 1920 in Martinsville, the daughter of the late Nicholas and Cornelia (Faust) Annen. She was united in marriage to Edward Haas on Oct. 16, 1941 in Martinsville. She was a member of St. Aloysius Catholic Church and the Council of Catholic Women. 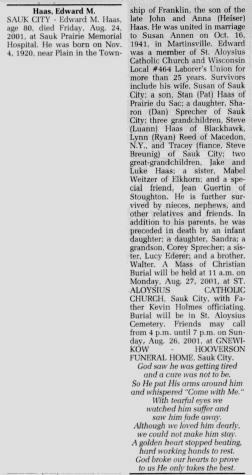 Mrs. Haas is survived by a daughter, Sharon (Dan) Sprecher, of Sauk City; a daughter-in-law, Pat Haas, of Prairie du Sac; three grandchildren, Tracey (Steve Breunig) Sprecher, Steve (Luann) Haas, both of Sauk City and Lynn (Ryan) Reed, of Niagara Falls, N.Y; great-grandchildren, Dylan, Tyler and Bryan Breunig; Jake, Luke and Riley Haas and Mia and Ty Reed; one brother, Raymond (Bev) Annen, of Sun Prairie; two sisters-in-law, Avis Annen, of Mazomanie and Jeanette Annen, of Madison. She was preceded in death by her husband; an infant daughter; a daughter, Sandra; a son, Stanley; a grandson, Corey Sprecher; brothers Joe, Ed, and Werner Annen; an infant sister; sisters-in-law, Lucy (Herb) Ederer, Mabel (Bud) Weitzer and brother-in-law, Walter (Erma) Haas. A Mass of Christian Burial was June 12 at the St. Aloysius Catholic Church in Sauk City with Fr. Jared Hood officiating. Burial was in the church cemetery. Nicholas Annen married Cornelia Faust. Married Name Her married name was Annen. Cornelia Faust married Nicholas Annen. Name Variation Stanley Haas was also known as Stan. Stanley Haas was the son of Edward M. Haas and Susan Annen. Stanley Haas married Pat (?). Stanley Haas died between 2001 and 2010. Sandra Haas was the daughter of Edward M. Haas and Susan Annen. Sandra Haas died before 2001. Infant Haas was the daughter of Edward M. Haas and Susan Annen. Infant Haas died at died in infancy. Corey Sprecher died before 2001. Joe Annen was the son of Nicholas Annen and Cornelia Faust. Joe Annen died before June 2010. Ed Annen was the son of Nicholas Annen and Cornelia Faust. Ed Annen died before June 2010. Werner Annen was the son of Nicholas Annen and Cornelia Faust. Werner Annen died before June 2010. Infant Annen was the daughter of Nicholas Annen and Cornelia Faust. Infant Annen died at died in infancy. Walter Jacob Haas married Erma Marie Ruhland, daughter of Alois A. Ruhland and Christina Anna Schwartz. Walter Jacob Haas was born on 18 July 1912 at Wisconsin. Walter Jacob Haas died on 6 November 1990 at age 78. John M. Mears was born on 2 November 1939 at Wisconsin. John M. Mears married Barbara Ann Foss, daughter of Robert Foss, before 1961. John M. Mears died on 4 November 1961 at Wisconsin at age 22 Obituary of Mr and Mrs John M Mears from automobile accident 06 Nov 1961 Wisconsin State Journal (Madison, WI). 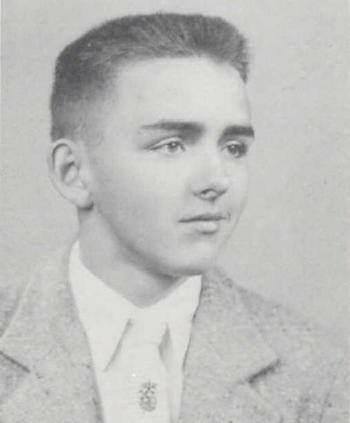 John M. Mears graduated in 1957 at Webb High School, Reedsburg, Sauk, Wisconsin. Name Variation Herman Leo Halverson Jr. was also known as Leo. Herman Leo Halverson Jr. married Ruth Ann Greenheck, daughter of John Joseph Greenheck and Agnes Catherine Roessler, in November 1953 at Wisconsin Ruth Ann Greenheck and Herman L Halverson Jr wedding announcement. Name Variation Henry Donatell was also known as Hank. Henry Donatell was born on 25 July 1938. He died in July 1987. Name Variation Raymond Daniel McCarville was also known as Ray. Raymond Daniel McCarville was born on 19 December 1934 at Plain, Sauk, Wisconsin. He was the son of James Francis McCarville and Alma E. Nachreiner. Raymond Daniel McCarville died on 10 December 1995 at age 60. [S373] U.S. Federal Census 1940 U.S. Federal Census, by Ancestry.com, Year: 1940; Census Place: Bear Creek, Sauk, Wisconsin; Roll: T627_4523; Page: 2B; Enumeration District: 56-9. Walter Blair was born circa 1898 at Wisconsin. He married Loretta McCarville, daughter of Francis McCarville and Julia Farley, before 1940. [S373] U.S. Federal Census 1940 U.S. Federal Census, by Ancestry.com, Year: 1940; Census Place: Madison, Dane, Wisconsin; Roll: T627_4469; Page: 9B; Enumeration District: 13-52. John Gray married Sylvia I. Premo, daughter of Kenneth Lyle Premo and Dora Elizabeth Hill, on 3 July 1937. John Gray died in 1971. Married Name before 1934 As of before 1934,her married name was Hutter. Phyllis Davis was born on 31 March 1914 at Wisconsin. She married Irvin John Hutter, son of Michael John Hutter and Amanda Fay Wasley, before 1934. Phyllis Davis died on 22 February 1980 at age 65. [S373] U.S. Federal Census 1940 U.S. Federal Census, by Ancestry.com, Year: 1940; Census Place: Milton, Rock, Wisconsin; Roll: T627_4521; Page: 5B; Enumeration District: 53-54. Married Name before 1933 As of before 1933,her married name was Hutter. Violet (?) was born circa 1914 at Illinois. She married Roy Hutter, son of Michael John Hutter and Amanda Fay Wasley, before 1933. [S373] U.S. Federal Census 1940 U.S. Federal Census, by Ancestry.com, Year: 1940; Census Place: Beloit, Rock, Wisconsin; Roll: T627_4519; Page: 2B; Enumeration District: 53-11. Married Name 26 April 1939 As of 26 April 1939,her married name was Greenheck. Alice Irene Peterson was born on 24 November 1918 at Wisconsin. She was the daughter of Hans P. Peterson and Louise A. Stewart. Alice Irene Peterson married Andrew Greenheck, son of Arnold Greenheck and Rosina M. Hutter, on 26 April 1939. Alice Irene Peterson died on 24 January 2012 at age 93 Alice I. Greenheck age 93 of Spring Green passed away on Tuesday, January 24, 2012 at the Greenway Manor Nursing Home in Spring Green. She was born on November 24, 1918 the daughter of Hans and Louise (Stewart) Peterson. Alice grew up in the Lone Rock area. She was married on April 26, 1939 to Andrew Greenheck. Alice and Andy enjoyed 47 happy years of traveling, fishing, cribbage playing, square dancing, gardening, cooking, canning, freezing and loving grandchildren. Alice loved baking cinnamon rolls, peanut bars, cookies, pies and sharing all of these with others. Survivors include 2 daughters, Mary Lou (Jerry) Baryenbruch of Spring Green, Kathy (Al) Anding of Monona, 7 grandchildren, Diane Baryenbruch, Mark (Lori) Baryenbruch, Brad Baryenbruch all of Spring Green, Vicki (Matt) Beglinger of Mount Horeb, Scott (Brianna) Baryenbruch of Barneveld, Aaron (Nadia) Anding of Middleton, Jason Anding of Monona, 7 great grandchildren Megan, Adam, Brett, Trevor, Nolan, Gavin, Aidan and Baby girl Beglinger, a sister, Shirley (James) Greenheck of Lone Rock. Waiting to greet Alice home are her parents, Hans and Louise Peterson, her husband, Andy who died on May 21, 1986, a brother, Milton, 2 sisters, Evelyn and Maureta and an infant grandson, Joseph. Funeral Services will be held on Sunday, January 29, 2012 at the Christ Lutheran Church in Spring Green at 2:00 P.M. Rev. Douglas Larson-Sell will officiate with burial in the St. John’s Catholic Cemetery. Visitation will be held on Sunday at the Christ Lutheran Church from 12:00 Noon until the time of service at 2:00 P.M. The family wishes to extend their sincere thanks to the staff at Greenway Manor for all the loving care they gave to Alice over the past 6 years. God bless all of you, the Angels in her life. A special thanks to all who visited Alice and sent cards to her. It meant so much to her. In lieu of flowers memorials may be made to the Christ Lutheran Church or to a charity of choice. The Richardson-Stafford Funeral Home in Spring Green is assisting the family with the arrangements. [S250] U.S. Federal Census 1930 U.S. Federal Census, by Ancestry.com, Year: 1930; Census Place: Clyde, Iowa, Wisconsin; Roll: 2573; Page: 6B; Enumeration District: 6; Image: 707.0; FHL microfilm: 2342307. Name Variation Hans P. Peterson was also known as Hansie. Hans P. Peterson was born circa 1888 at Wisconsin. He married Louise A. Stewart circa 1911. [S373] U.S. Federal Census 1940 U.S. Federal Census, by Ancestry.com, Year: 1940; Census Place: Clyde, Iowa, Wisconsin; Roll: T627_4483; Page: 2A; Enumeration District: 25-6.